Club Penguin Cheats by Mimo777 Club Penguin Cheats by Mimo777: Club Penguin New Coffee Shop! Greetings! Club Penguin is updating the Coffee Shop with a whole now look! Here is a sneak peek of the new look! Awesome! CP is going to celebrate the new Coffee Shop Thursday at 12:30pm Penguin Standard Time! So get your coffee apron ready and join everyone on the server Snow Day to party! Are you exited for the new look!? It's needed new paint for a while, but I hope they are keeping the happy music. My Grandma says it sounds like a percolator coffee pot. I hope that they don't change the music. YAY!!! its abouttime they updated it! it was getting old before :/ now it looks way better!!! Awwwww..... but I liked the old look..... time to say goodbye, since Disney has to ruin everything. NO no no no noooooo! I love the old version. the new version will ruin every thing. You have to stop them Mimo.Put on an online petition on your website right away.please. "my name is icecube20 and I say that the coffee shop should be left as it is.and please remove the CP times news office from the book room." I'm guessing they are updating every room eventually. What time is that in british summer time. 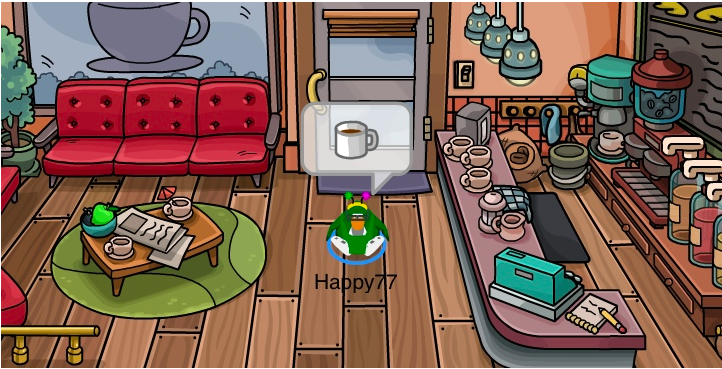 The coffee shop is the oldest room in Club Penguin. Changing it is just atrocious. Does anyone really want the room to change, honestly? It's FINE. I like the old style music too. You do it.It's your idea.I actually like it. Personally,I like the new one. Oh good, they kept the music. i agree with the others! the coffee shop was the one place unchanged! Why is everyone so upset?? ?